The starting point of this card was a color combo I found on Pinterest: Grey Granite + Balmy Blue + Fresh Fig + Blackberry Bliss. I liked that it brought in a lot of new hues (two new colors, one current In Color and one past In Color that just got brought back through the color revamp). I looked through current stamp sets to see what could work with that color scheme and when I saw Baby Bear, I thought that would pair well. Then, I remembered I had seen not one, but two baby-themed challenge online, so I got going. I'm not sure how I feel about the end result. It's cute, but it's simple. I think I need to sleep on it and reevaluate tomorrow. The background was stamped with the new Buffalo Check background stamp that will be released this weekend when the 2018 Holidays Catalogue officially launches. While it's part of the Christmas offering, this background can certainly be used for more, as evidence by this baby card here. 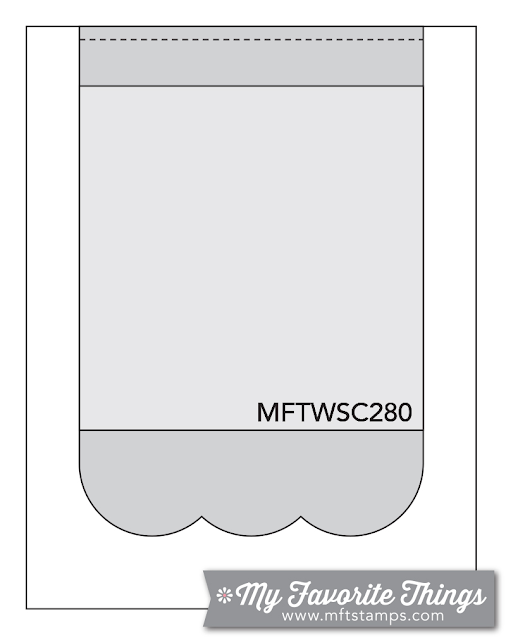 On a side note, I did what a lot of stampers are afraid to do: I cut one of my photopolymer sentiment stamp apart. I wanted the "something for baby" to be stamped on two lines, as the one-line sentiment was too long and wouldn't have filled the space as nicely, so I snipped the sentiment in half and mounted it the way I wanted on my acrylic block. It will be really easy to piece the sentiment back together if I want it on one line on a future project, but it saved me a lot of masking and figuring out proper spacing by cutting it apart. 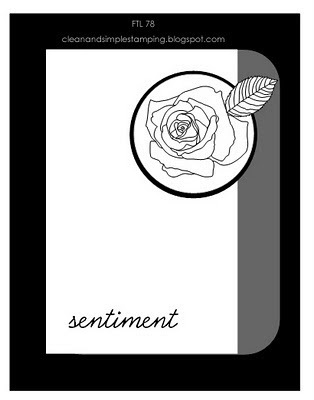 This card was based on the Reverse Confetti Sketch #53 (October). I pulled out some soft colored papers from Doodlebug and made sure to select those that didn't have blues or pinks to keep the card gender-neutral. I paired them with the Special Delivery stamp set (one of my favorite baby sets). The little ticket is from an older Stampin' Up! set and the text reads, "100% perfect sweet baby." During the fall challenge week on Splitcoast Stampers, I had tried the stenciled shaving cream technique and I made a few sheets using the shaving cream, trying to get the most out of it. I had a page left with stars on it and thought it would work well with the Moon Baby stamp set. This week's Stamp Ink Paper challenge #68 also had colour that could work well with the sheet so it was the starting point for my card. 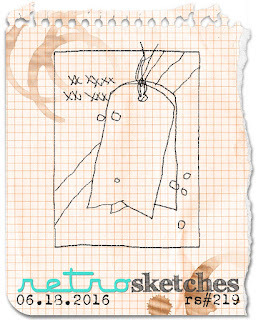 I used the sketch from Global Design Project #74 as well. That cute tag come from the Cheerful Tags Thinlits die set. It's meant to be a bottle tag, but I only used the bottom part and wove ribbon in the two holes to decorate it a bit. A heart die-cut out of shimmer paper was added to it, and my handcut baby, colored with a blending pen and ink on Shimmery White cardstock. The sentiment was embossed with Copper Stampin' Emboss powder, and I added a couple of enamel shaoes to the heart and sentiment. The top felt a little bare, so I stamped a lace border from the Delicate Details stamp set (Sale-A-Bration free gift). You might have noticed I keep using it on a lot of project. It's one of those sets that you can get a lot of mileage out of because you keep sneaking it into many projects. It was love at first sight with the Moon Baby stamp set from the Occasions catalogue. Too bad it's not translated to French, but the silver lining is that it allowed me to get this stamp set in wood-mount. I drew inspiration from the Hand Stamped Sentiments Sketch #256 and paired the stamp set with the Carried Away Designer Series Paper offered as a free item during Sale-A-Bration. The cloud pattern was perfect to go with the baby sleepingon the moon, and that image fit perfectly in the biggest stitched circle die from the Stitched Shapes Framelits. For the colour combo, I started with Mint Macaron, which was the sky colour on the patterned paper I have selected. 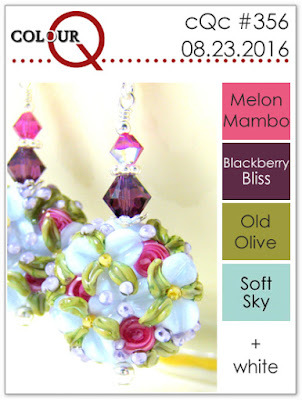 I looked at past ColourQ combos for inspiration and #331 caught my eye, so I picked current colours to create a similar look. The two bottom strips of cardstock were stamped with Delicate Details, a stamp set also offered during Sale-A-Bration (I expect I'll be using this one a lot). I stamped the three stars image from the stamp set and colored them with Gold Wink of Stella, before cutting them out and adding them around the main image. The stamp set includes great sentiment, but I wanted something in French so I selected "Congratulations" from the Iconic Occasions hostess stamp set (2017 Occasions Catalogue). And that adorable frame? It's part of the Build It Framelits collection (the one with the tools). 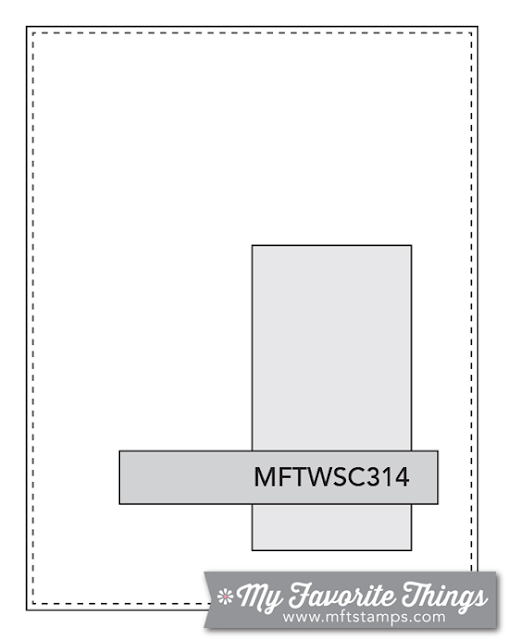 It cuts out a tag with a frame. 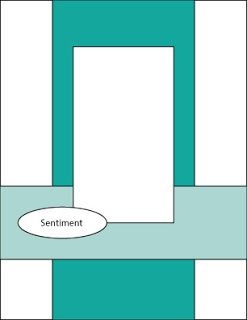 It you handle the frame carefully, the outside will stay on the piece and you have a tag with an impressed border. 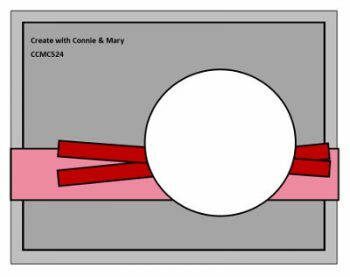 But you can also tear the two pieces apart, so I was able to create an outer frame in Bermuda Bay cardstock and glue it over the first piece. The Mint Macaron cardstock was covered with Clear Wink of Stella to make it shimmery. Gold enamel shape stars were also added to the background. I needed to add baby cards to my stash and spotted a baby dragon in the Magical Dragons stamp set, so I got inspired to use this image for a non-traditional baby card. 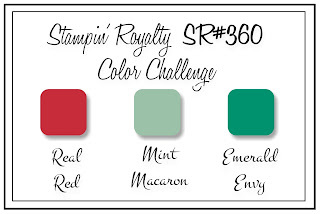 The design came from MFT Sketch #314 and the colors from Stampin' Royalty #360. Again, I had some MME papers put aside for a baby card, and one of the sheets had polaroid frames on it, so I handcut one and used it for my main image. I stamped the dragon and puff in Tuxedo Black Memento ink and colored the image with my Prismacolor pencils. This is my final card for Falliday Fest - I'm done with all of the challenges! Since this one called for a special watercolour background, I kept the design simple to not hide it too much. I was skeptical of how the watercolour would look because the colours were bleeding into each other more than I was expecting when the glossy paper was still wet, but it dried into a really cool look that was perfect for a sky, which softer patches that look like clouds. It became the perfect background for the stork. For the design, I drew inspiration from Sunday Stamps Sketch #137 (turned sideway) and only placed a long strip of cardstock at the bottom. I was looking for a bold sentiment that would work for a baby and found "And they lived happily ever after" in Big News, which I thought worked great. I embossed it in navy powder, and added little clusters of stars in Daffodil Delight ink around it. Balloons and baby booties from the same stamp set were added as well. This is another card that was inspired by a Falliday Fest challenge. I dusted off some older sets that have a special spot in my heart, but that had not been used in a while. The first one is Ann Egg-cellent Easter, which I masked while inking to omit the eggs he's juggling with and keeping only the bunny so that I could turn this sweet image into a baby card. Because he wears a best and bow tie, and because I stumbled unto some blue baby-themed papers while looking for stamps, this one naturally evolved into a baby boy card. I die-cut my own doily using the retired Darling Doily Thinlits die and thought to use the Bow punch to add a bow on top of my main image. As I was looking for a sentiment to finish off my creation, I found the baby announcement stamp in the Little Additions stamp set and decided to go with it. I was really surprised when I tried to punch it out with the Modern Label punch to discover it's too small! You can punch out the text, but it will not keep the frame, which I think it a lovely part of the design, so I bit the bullet and went old-school with fussy cutting! The third stamp set I dusted off is All Scallops, a border set that I've always loved using and that retired way too fast for my liking back when it was in the catalogue. (Don't know that it lasted more than a year.) I wanted to watercolor my main image, so I inked the bunny with Tuxedo Black Memento ink and stamped the image on Shimmery White cardstock, which is a great alternative to watercolor paper, especially if you don't want to bother with StazOn ink. Baby cards always seem to sell well and it's not something I make a lot of. I had looked at the Special Delivery set before and passed on it, but finally decided to get it because I love the idea of the stork and felt I could use to add baby imagery to my collection. This week's ColourQ #356 challenge provided inspiration for the colours. It's not typical baby colours, but with the pink and blue, it does tie with the baby theme. I made sure to avoid pink or blue on the baby bundle itself to keep the card gender-neutral. 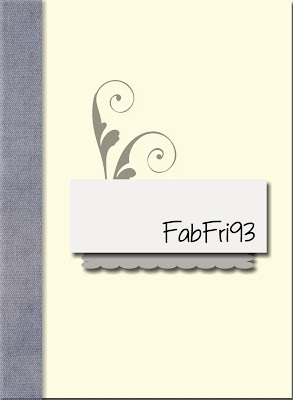 The Soft Sky cardstock was embossed with the Cloudy Day embossing folder from an old Occasions catalogue. 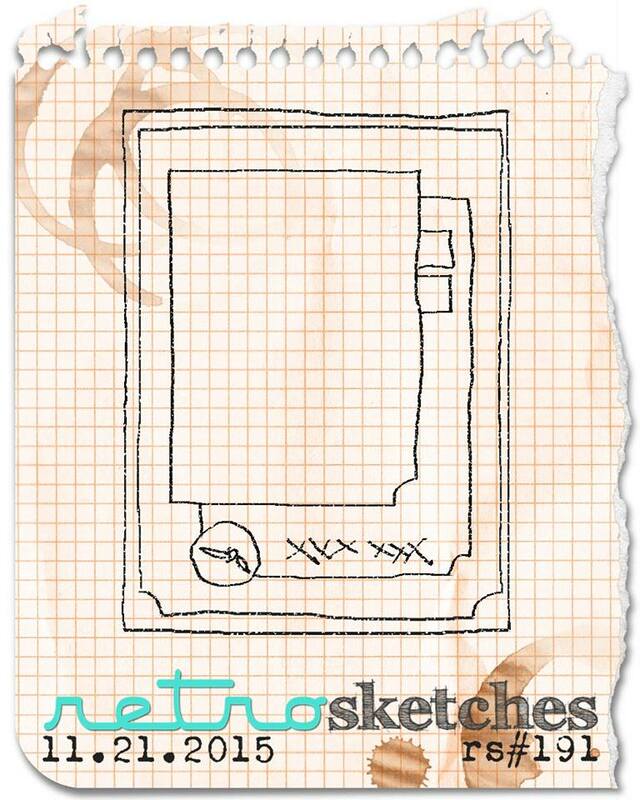 Because the pattern is meant to be used on a portrait card, I could only emboss the top of the cardstock. I solved the problem by stamping clouds from the stamp set at the bottom in Soft Sky ink. The Melon Mambo piece was stamped with the A to Z stamp (long retired, but still a personal favorite). The little circles are Enamel Accents from Ranger. I got a few colours and tested them out on our Silicone craft sheet to make my own enamel shapes. I found the biggest challenge is to keep a steady hand to make perfect circles, but those didn't turn out so bad. 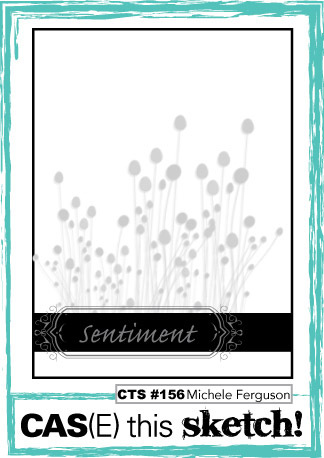 The card design was inspired by Try Stampin' on Tuesday #285. The optional challenge was embossing, and I used dry-embossing on my background piece. The design of this card was inspired by Fab Friday #93 and the rest all came from paper scraps from my Dare to be Dirty challenge stamping bonanza. considering this card was all made from scratch, I think it turned out pretty decent! I wanted the watercoloring to match the vintage look of the Cosmo Cricket paper so I reached for Distress Inks I bought years ago before I started building my SU! ink collection and that had not seen the light of day in almost as long. I only have two colors - a tea dye brown and a pinkish gue and they both happened to match the paper perfectly. I watercolored on regular Very Vanilla cardstock instead of watercolor paper so it was a little harder to control the coloring, but again, not too bad. The sentiment is equally as old, as it's one of the first hostess sets SU! offered in the days when they first came to Quebec. The translations were still a little approximate back then so there's a few of those stamps that have never seen ink, but I needed a very small sentiment to fit in the corner of my image and the "totally adorable" stamp was just perfect. The little row of heart holes was done with a die from the Everyday Jar Framelits collection, and the scribble heart came from the Sunshine Wishes Framelits set. Baby Bear immediately caught my eye in the annual catalogue and I knew that it would be a nice addition to my stash, for baby cards and because teddies make everyone go, "Awww!" 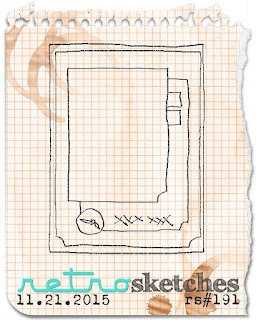 To ink it up,I paired the Global Design Project challenge #41 (color combo) with the Retro Sketch #219. Because the colour combo called for Sweet Sugarplum colour, I wanted to use the Painter's Palette DSP stack, but the neutral in those papers is Very Vanilla, so I had to slightly change the colour combo. Considering I only changed the neutral, I'm hoping I can be forgiven? The cute narrow washi tape is from the accessory kit of one of the new Project Life kits released in the catalogue as well. The larger washi tape came from another Project Life accessory kit (last Christmas' Hello December, I think?). My card background was embossed using the Lucky Stars embossing folder and I highlighted the stars with the Clear Wink of Stella brush. 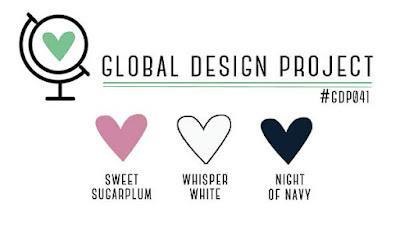 The design was inspired by the Sugar Pea Designs #55. The Bella Blvd I had in my stash had some cute 3" x 4" die-cut images on them and one of them grabbed my attention as a great image to turn into a baby card. 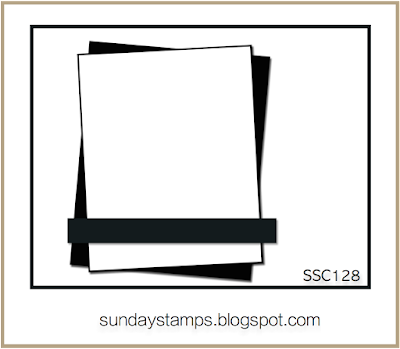 That made for an easy and fast card to put together, inspired by the Sunday Stamps #128 sketch. I had a chipboard heart that I found while cleaning supplies that had stayed on my desk and the shape was great to fit with the background paper so I embossed it with two coats of white embossing powder and added two matching brads on it. The sentiment was created with a cute image from the Little Additions Stamp set, and then I stamped the word "baby" with an alphabet set to finish the sentiment. The image was fitting a little too snuggly on a regular 4-1/4" x 5-1/2" card, so I changed my card size to a 4-1/2" x 5-1/4" size and use the Envelope Punch Board to make a matching envelope. I rearranged my stamp room closet a big and got my 12x12 plastic drawers out of the closet and directly into the room. I think it's be easier to rummage through my paper scraps when making projects and put them to better use. This is what I did for my envelope here, looked at my green scraps (they're arranged by colours) and found a piece big enough for punch the envelope out of. I'm short on baby cards - again! - and I found some Little Yellow Bicycle papers and stickers in my stash that inspired me a quick card based on the MFT Sketch #280. This card was born out of discarded images. I had some new watercolor paints that I wanted to try, so I used scraps of watercolor paper, stamped random images and colored them to test out the watercolors. After I was done, I thought they might look good enough to actually make it on a card. I was in need of baby cards (but to be honest, not really in the mood for baby carriage and rattle images) so I thought a little fairy could work and be different. 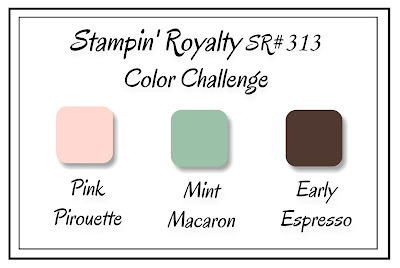 For the design, I drew inspiration from the Mojo Monday Sketch #443 and the colors came from Stampin' Royalty #323. I was also inspired by the Simon Says Stamp Wednesday challenge, to use polka dots. Their showcased products are also Lawn Fawn, and it just so happens that I have a paper pad called Let's Bokeh in the Snow from them that was perfect for the project. The bokeh paper has this magical fairy dust look that works well with the theme of the card. I sprinkled little sequins where the stars are on the sketch, and I used the Glimmer Tape that was offered during Sale-A-Bration to create the banner. Here's another baby card for my collection. 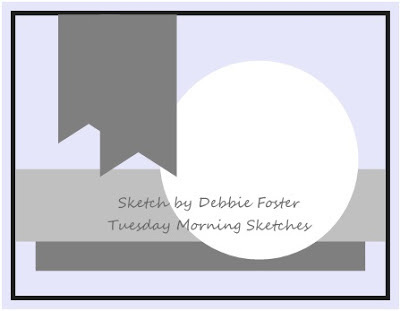 This one was inspired by the Tuesday Morning Sketch #347. 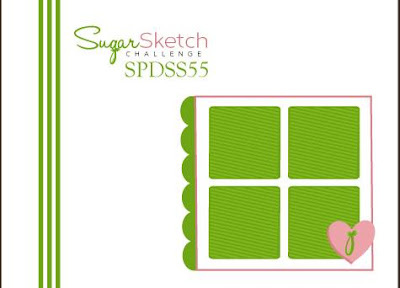 I wanted to use my new Sweet Things Doodlebug Design papers and even though they're Valentine's Day inspired, I thought the heart patterns could work for a baby card, especially with the pink and mint shades in it. We've been having a baby boom at the office, so I'm scrambling to keep up with the baby card demand. I'm trying to keep them as gender-neutral as possible since I never know ahead of time what's going to be needed. 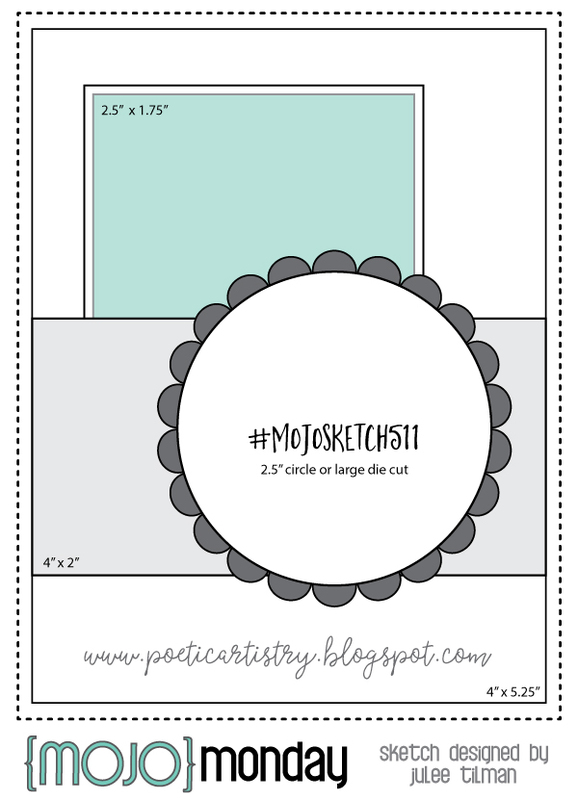 When I was looking at my paper stash, I came across the Fiddlesticks paper stack and thought it would look pretty on a baby card, so I paired it with the Mojo Monday sketch #436. There's a baby boom at the office and I've been warned that there are six maternity leaves coming up at the office in the Communications department alone, so I have been asked to keep baby cards on hand. So I'm trying to squeeze one in every time I stamp these days. Leafing through old Paper Crafts publication, I found a card with little birds made with buttons. Reminded me of the Button Buddies stamp set, so I pulled out the Subtles Designer Buttons, selected colours that could work for a baby card, and then used scraps of Designer Series Paper at the bottom to match the buttons. As a last minute addition, I decided to add smaller buttons in similar colours on the paper scraps as well. A piece of White Cotton Ribbon was tied, a sentiment from the And Many More stamp set (Annual Catalogue, p. 105). Baker's twine in shades matching the buttons was used to thread them. Simple but cute and more importantly, gender-neutral with all the colours used. I found the "welcome baby" sentiment in the Little Additions stamp set and added it to a border cut out of another piece of patterned paper. Would you believe I almost passed up on getting the Balloon Celebration stamp set? I had a long wish list and kept going back and forth on what to get. It's finally the hostess benefits that decided me to get the bundle (which includes the matching punch). I've only done one card with the stamp set and I'm already in love! There is something so soft and sweet about the way those balloons are drawn that's very endearing. I found some paper scraps that were perfect for a baby creation, so they inspired me the following card. I simply used a band from patterned paper, added an orange border to it and pearls to the scallop motif. 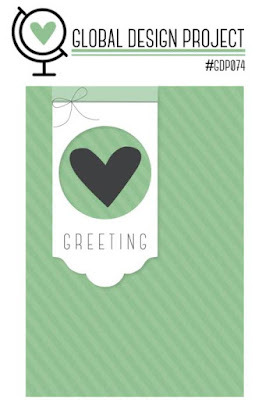 Then, I stamped a little "welcome, baby" banner on white cardstock, wrapped it around a piece of Crumb Cake cardstock and I inserted it in a slit made in the paper using a craft knife, so that it would be on top of the train. I then punched little clouds of smoke out of Dazzling Diamonds Glimmer Paper (love that stuff!) and added those coming out of the engine. A die-cut was added as well, and the card background was embossed with the Perfect Polka Dots Embossing Folder. One of the theme on my list of cards to add to my pile is baby cards, and I'm trying to make them neutrals because it appears that people are always in need of girl cards when all I have left is blue cards and vice versa. This card came about after putting together a traditional scrapbooking page. I had cut off the "Havin' a good time" sentiment to use on the page and was left with the sunshine image. 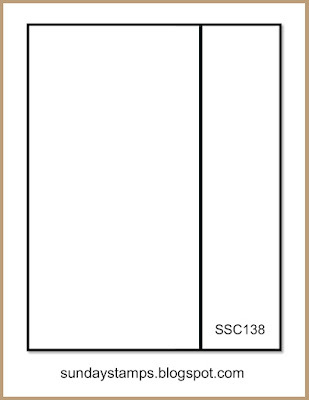 For some reason, I kept thinking it would work great on a baby card, so I put the idea to paper after being done with the page. I had first planned on stamping a sentiment in the white space in the top left corner, but when looking for appropriate sentiments, I stumbled unto one from the Big News stamp set that was absolutely perfect. (Even better is the fact that I hadn't managed to use this one yet due to his size, so it was a great chance to get it inked finally.) I embossed the sentiment in Gold Stampin' Emboss Powder to make sure it would be easy to read over the image. At top, I used the Curvy Corner Trio Punch (I've already used this punch a ton) to add a bit of polka dot organza ribbon. A band of patterned paper from the same paper stack was added and embellished with three Regals Candy Dots. My trusty Envelope Punch Board was used to make a matching envelope out of another paper from the same stack. There's been a baby boom on our team at work and all of my baby cards on hand got given away, so I knew I had to make some more when I had the chance. I made a careful effort to make them gender-neutral because whatever gender I pick when making a baby card, it seems that what I need is the other one (Murphy's Law, I guess). I found remaining pieces of the Hello Baby collection from Simple Stories I had used for the baby album I shared not too long ago and based on the Retro Sketch #189, I made my first card in a flash. As I was putting away the scraps, I noticed the polaroids on one of the piece of papers and thought I could handcut one and use it paired with the Paper Players Sketch #272. I wasn't planning on making a second card, but since my mojo was on, I decided to just roll with it. I needed an envelope for my friend's baby card, so I decorated a vellum envelope and pinned it on my gift bag using mini clothespin on which I glued a thin strip of champagne glimmer paper. My friend's sister had informed me that the theme of the baby's room was owls, so I pulled out my owl punch to do a little wink to that. The vellum envelope was run through the Big Shot using the Large Polka Dot Embossing Folder. I received this beautiful picture of my friend's baby and I wanted to keep it, so I created a layout around it. The Cut & Paste papers from My Mind's Eye were the perfect colours to go with the picture. I had the pleasure to meet Maélie last week and she's such an adorable, easygoing, smiley baby. Can't help but be taken by her! Inspired by some Dare to Get Dirty challenges and Mojo Monday sketch #409. I like that this baby card is sweet and gender-neutral. I used the adorable ducky from the Something for Baby stamp set (available in the current Stampin' Up! annual catalogue). I used the Eclectic piercing templates to add piercing around the duck and the tag. Some presentations from Leadership were streamlined, including one by Shelli where she showed the cutest scrapbook layout ever. I was totally taken with her project, so I snapped a picture and made a mental note to reproduce the layout when I had the chance. I finally got around to it last week. Most of what you see on the pages is taken directly from Shelli's project, but I did adapt a couple of details. This project came about a little differently. I was going through a pile of stuff to put away and found a Make 'n Take project from a few conventions ago. It was a decorated chevron pocket that I had never used. Looking at the sentiment, which in French reads, "Life in pink," I thought the sentiment would be great on a girl baby card. Instead of pulling this set (already retired) to make a brand-new card, I figured I could reuse the elements from the pocket to turn them into a card. Recycling and saving time! So the card background is actually the pocket that I cut apart to turn into patterned paper. I already had the sentiment with the glimmer paper circle and the olive banner with rhinestone and chevron ribbon, so using the Freshly Made Sketch #187 as inspiration, I cut a tag with the Apothecary Accents Framelits dies out of vellum and added heart-shaped holes in it using a die from the Mini Treat Bag Framelits set. The leftover vellum hearts were glued at the top of the card and decorated with rhinestones. I used the Something for Baby stamp set to stamp the onesie and hanger, and used the matching Baby's First Framelits dies to cut out of the images.